Soon after the ESA flight I had again the occasion to fly on one - or better - two parabolic flights. That came like this: First of all I have many e-mail friends in Vienna. After my parabolic flight in Bordeaux and on their request I decided to visit them, because we hadn't seen each other before. Paul is one of them, and himself organizer of parabolic flights, he wants to make them possible and affordable for anyone. He naturally was interested in my experiences on the ESA flight. Because he wanted to start with his first commercial flight at about the same time I was in Vienna, he had the idea that I, as a proven ESA parabolic flyer who had no problem with nausea and so on, should accompany him as a 2nd instructor (he is the other) on his flight. I sure couldn't pass this chance and organized my stay in Vienna to be able to fly with him. On the 28th of September 2002 the flights were scheduled to take off. So the evening before we drove out to Trencin in Slowakia. We stayed over night at the airfield, the rooms there were nice and cheap, and the local restaurant had good food for a real good price, we only had to pay in slowakian money because they didn't accept Euros. We changed Euros into slowakian money at the exchange counter when crossing the border. The airfield is an old military base with lots of old aircrafts (most of them unable to fly) and other military remnants too which we looked at when waiting for the flight. It was possible to take pictures of them unrestricted. I have been told that the old town of Trencin with the castle is also worth visiting, but we indeed had no time to do so. Now, our aircraft was scheduled to arrive the next morning, but at first the disappointment was big when it wasn't there because of bad weather. The whole morning we were hoping for the clouds to open, because parabolic flights can only be done under visual flight conditions. Around noon finally we had the relieving message that in any case the airplane was on its way to us. But when the weather wasn't good to us, this all would not be of much use. So we were still waiting anxiously, because the sky didn't look very promising. The only possibility would be to fly on Sunday. 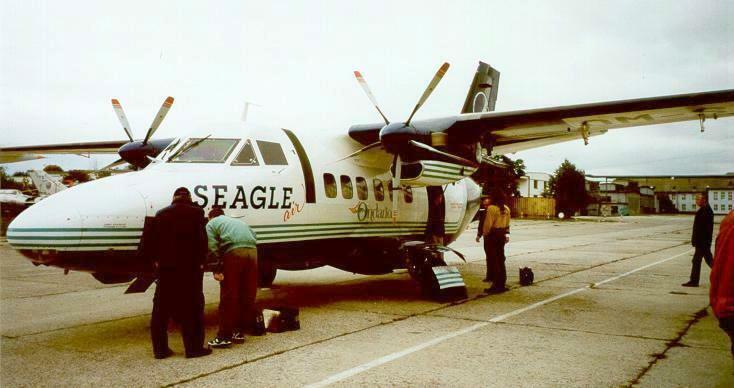 But our pilots, who were already at the airfield, were running around with satellite pictures already (the aircraft of course came with different pilots, Seagleair has their residence in Trencin and Bratislawa). In the meantime our passengers arrived - except Maria Pflug-Hofmayr, a journalist of the german astronomical magazine Star Observer, who came with us the day before. 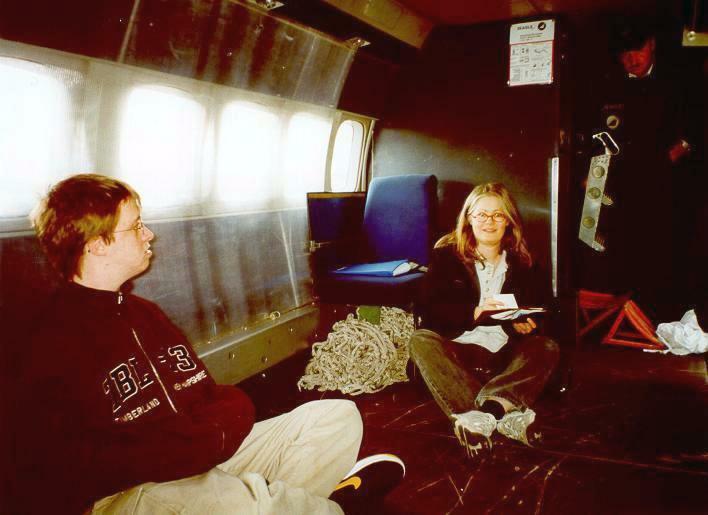 The other 5 passengers were partly paying passengers, partly winners of a competition which had won the parabolic flight. 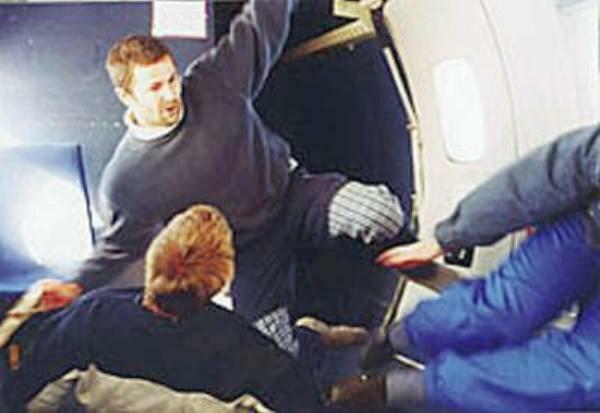 Each time 3 passengers would be on one flight. Soon our aircraft arrived, a twin-engine propeller aircraft of the type LET 410, already emptied, because it is normally used for cargo flights. So we didn't have much to prepare. The cleaning and preparation for the parabolic flight was up to Seagleair personnel (no one wants dust floating in the cabin of course). In the meantime it was time for us to hold the briefing with the passengers, to prepare them for their upcoming experience and do the rest of the formalities. For me it was a strange feeling to now stand in front of the people myself after sitting in the audience just three weeks before for the ESA flight. After that we had to wait again until the weather got better. It was not sure yet if we could fly or if we had to postpone the flights to Sunday. So we ordered lunch, and like it always happens, just then when we were waiting for the food we got the go for the flights, first flight in half an hour. But the food arrived in time for me, so after that I could help Paul to prepare the airplane, fix safety straps and cameras and talk with the pilots on how to announce the parabolas. Now it was time, we could take off. The passengers and also we had changed our into comfortable clothes for the flight, Ruth, Pauls girlfriend, who was our "ground crew", collected our shoes - for safety reasons, so no one gets hurt, we flew without shoes. The fuselage of the aircraft is emptied as said before to have room to float around, only one seat was left in place. The rest of the crew was seated on the floor with the back to the flight direction, just as the parachutists do it, too. Shortly after takeoff we were above the clouds, in our designated flying area. Now the fun could start. 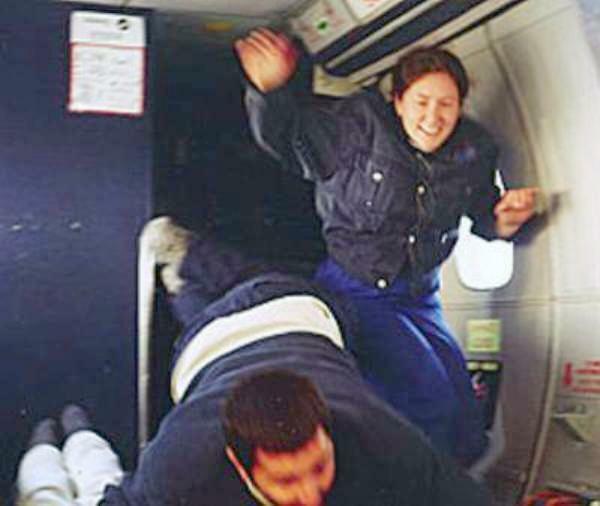 Our job was to take care that the passengers don't get hurt and to be there for the ones who get sick (sure enough we had enough airsickness bags with us). 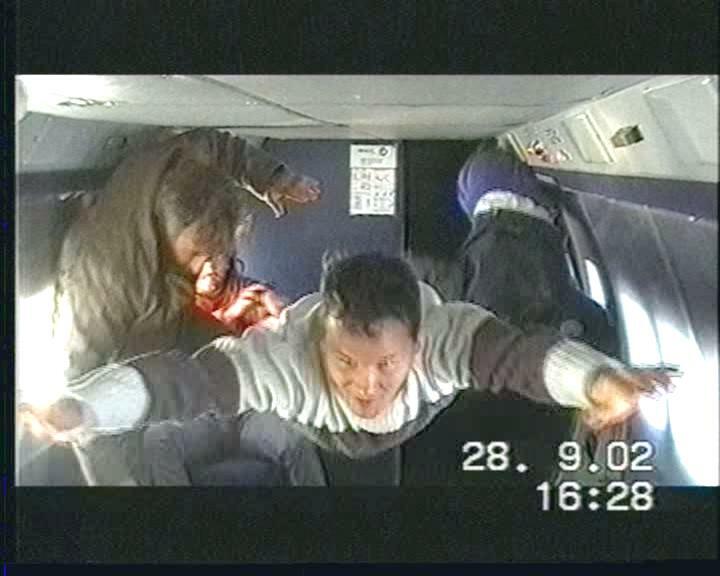 Because of some turbulences due to the unsteady weather unfortunately some of the parabolas were not completely zero-g or messed up a little, so at the beginning we had some hard time to keep the passengers from flying into the corners. 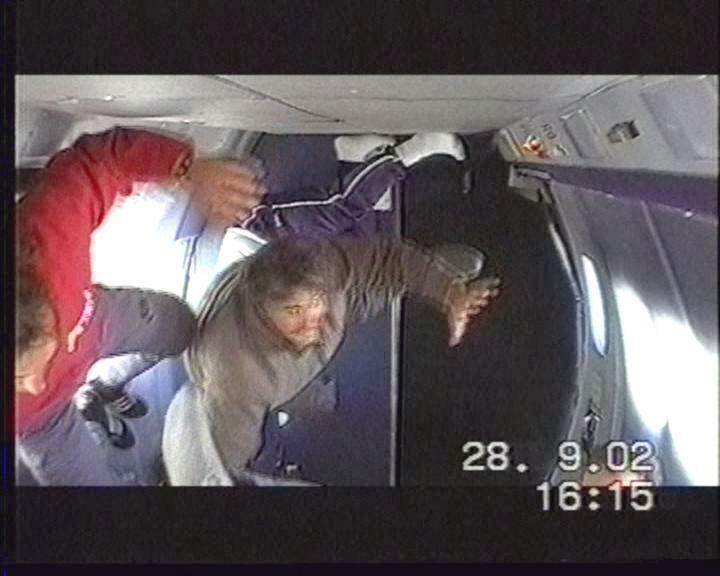 Naturally their unfamiliarity with weightlessness played a role too. For the bad parabolas at the beginning the pilots did two more for us. But we as instructors had our fun, too. Close to the end of the flight one of the passengers was not feeling too well, so I strapped him into the seat, but after the flight he told us that he still found that the flight had been a great pleasure for him. The second flight was similar, but more calm because of the better weather conditions. At the beginning I had more to do because on this flight the journalist was with us, who naturally wanted to take some pictures. 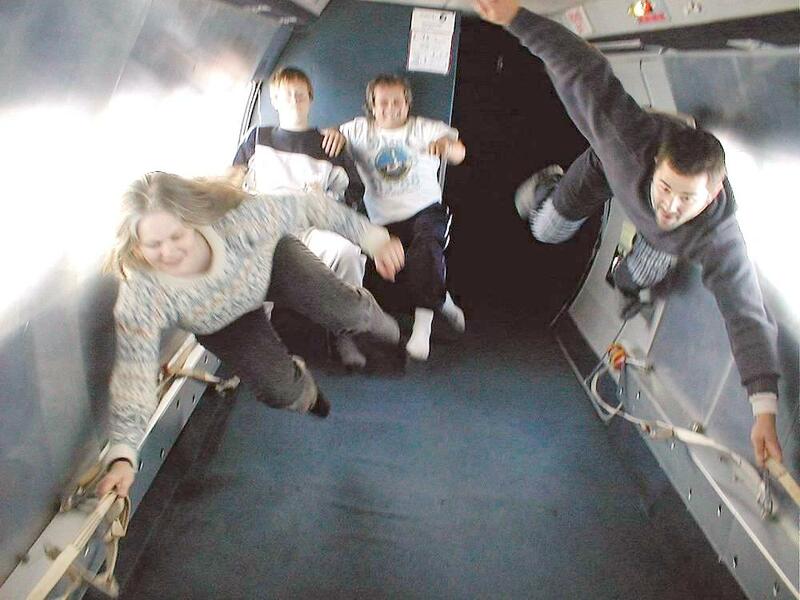 Again one of the passengers got sick, but the others got along well with the zero-g, so I could also show some of the tricks I already learned on the ESA flight. And again the pilots did two extra parabolas for us. They were having fun too flying parabolas for us, we could see that when they looked back to us for a moment, they were smiling all over the face. Altogether it was great fun for all of us, even though with some passengers getting sick, and everyone agreed that they would like to repeat this experience. There was also an article about this flight in the November issue 2002 of the german astronomy and space magazine "Star Observer" (german, PDF 778 KB) and in the 5th issue 2002 of the "SkyRevue" (german, PDF 116 KB).